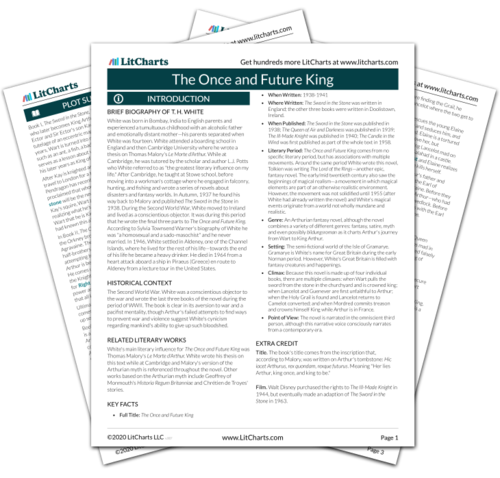 Instant downloads of all 942 LitChart PDFs (including The Once and Future King). 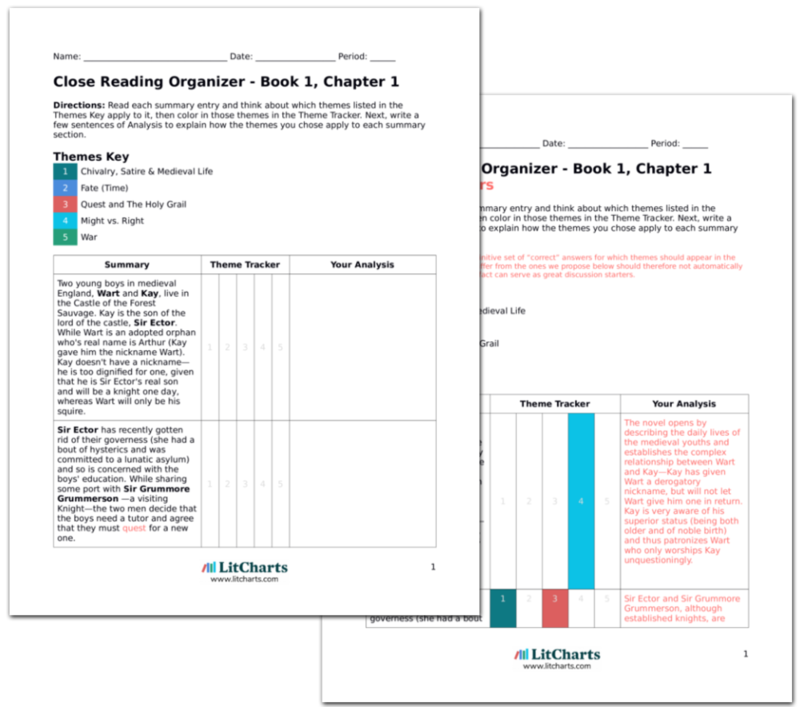 LitCharts assigns a color and icon to each theme in The Once and Future King, which you can use to track the themes throughout the work. Wart is moping in the castle. He goes to Merlyn in the hope of some education. Merlyn suggests that he try being a hawk and promptly turns Wart into a Merlin (a type of hawk). Before taking him to the Mews (where the Hawks live), Merlyn first warns Wart not to go near to Cully's special enclosure because he is not quite right in the brains. He also tells Wart to respect the Hawk hierarchy and how certain species must be treated with deference. Wart's behavior at the beginning of this chapter reminds us of his youth—he is only a young child prone to bouts of immaturity. The lesson with the hawks is important because it teaches Wart about both the virtues and vices of hierarchy among a group of people. All the other hawks are hooded, silent, and stately in the August moonlight in the Mews. A few moments after Merlyn had left Wart, there is a gentle ringing of a bell and the great peregrine falcon announces, "Gentlemen, you may converse." While Cully mutters nonsense at the end of the room, the other hawks enquire after the new officer. Wart announces himself and quickly says he is of the Yorkshire Merlins. He is then initiated through a series of questions ("What is a Beast of the Foot" etc.). The process of initiation Wart must undergo as a hawk is much like the initiation of the knight. It seems—to the outsider—very unnecessary and peculiar. Moreover, in order to be accepted by the others, he must prove his ancestry and family (all of which Wart makes up on the spot). Again, using the position of the outsider, this emphasis on ancestry seems both odd and unfair. Wart, passing the questions, is sworn in as a new officer and must now pass an ordeal. The other hawks debate and decide that Wart must stand by Colonel Cully while they ring the bell three times. Wart agrees (although he had been warned by Merlyn not to do just this) and proceeds to Cully's enclosure. While he stands near the cage, Cully whispers madly, telling Wart to move away from him; as the second bell rings, Cully moves closer to Wart and turns his mad, brooding eyes upon him. Just as the third bell rings, Cully lashes out his talons that fix themselves in Wart's side as he takes off into the air; but Wart manages to get free, leaving only his outer layer of feathers behind. To herald Wart's achievement, the hawks sing the Triumph Song. Cully, the mad hawk, is a peculiar representation of might: he does not wish to hurt those around him but, much like Mr. P, is unable to resist the power and violence of his insanity. It is only because of the cage that he is unable to harm those weaker than him. Cully illustrates the blindness and insanity of unrestrained might. Meanwhile, Wart is celebrated for withstanding pain. Hopkinson, Sarah. "The Once and Future King Book 1, Chapter 8." LitCharts. LitCharts LLC, 18 Dec 2013. Web. 20 Apr 2019. Hopkinson, Sarah. "The Once and Future King Book 1, Chapter 8." LitCharts LLC, December 18, 2013. Retrieved April 20, 2019. https://www.litcharts.com/lit/the-once-and-future-king/book-1-chapter-8.